I was a good geek this year, and received a framed Mt. Xinu 'Death Star' poster. 4.2 > V!! For students of Unix history, this poster is an all-time classic. Featured in the Jargon File (now in print form as the New Hacker's Dictionary, by Eric Raymond). The AT&T corporate logo, which bears an uncanny resemblance to the Death Star in the Star Wars movies. This usage was particularly common among partisans of BSD Unix in the 1980s, who tended to regard the AT&T versions as inferior and AT&T as a bad guy. Copies still circulate of a poster printed by Mt. Xinu showing a starscape with a space fighter labeled 4.2 BSD streaking away from a broken AT&T logo wreathed in flames. I received this poster as a young Unix geekling in 1991, when, inspired by the Jargon File, I wrote Mt. Xinu and requested a copy. They were kind enough to send one. Miraculously, 2 apartments and 1 house move later, I still have it, and asked to have it framed this year for Christmas. Marty Braun did a great framing job. I recently had my home office renovated, and it will make a fine addition. '4.2 > V' refers to the fact that Unix purists believe that BSD is the one true Unix, and is superior to System V Unix, hence '4.2 > V'. Mt Xinu (which is 'Unix TM' backwards) ran the 4.2 BSD kernel. 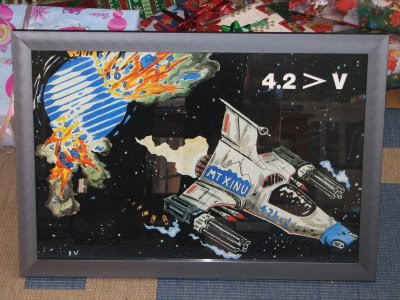 I also had a copy of a '4.4 > V' poster (by BSDi, if I remember correctly), but it has gone missing. If anyone has one, please let me know. I'd be happy to make an offer and add it to my collection. I'm at SANS CDI 2008, and just completed day 2 of the GIAC Security Expert (GSE) hands-on labs. I just got the good news that I passed!! The prerequisites for attempting the GSE are the GSEC, GCIA, and GCIH certifications with 2 of 3 gold. Then it requires a 4-hour multiple choice exam, followed by 2 days of hands-on exercises. The 16 hours of hands-on exercises were tough, but very fair. It's great to be done. I'll share more thoughts after I return from CDI. I just got the good word from Stephen Northcutt that I've been promoted to SANS Certified instructor. Just in time for SANS CDI, where I am content chair, and also attempting the GIAC Security Expert (GSE) labs.